Você lembra da sua senha? Located just five-minute walk from the city center, Bajloni market is one of the largest and oldest marketplaces in Belgrade. Because of its rich historical background, Bajloni maintained the atmosphere of past times and is still one of the Belgraders’ most beloved places to stroll around on Sunday and get some veggies. It has a good reputation when it comes to organic agriculture – the market is well-stocked with vegetables and fruits that come from nearby villages as well as other parts of the country. Apart from that, you can find just about anything – organic honey, fresh Danube fish and good-quality meat. I went to Bajloni early on Monday morning. The sun was shining for the first time in days after the rain and heavy clouds, and the happiness due to the change of weather was visible on people’s faces. There weren’t so many customers – local people tend to come to the greenmarket on weekends mostly. Sellers standing behind their market stands were in a hurry with placing all the fresh food they just brought. I noticed that most of them were friends that have known each other for years and acted as a sort of a family. I first talked to a granny named Ruza. Coming from a nearby village called Slanci, she has been in Bajloni market for 40 years now. Lovely and humble, Ruza has told me that she produces vegetables in a traditional way, without added chemicals or modifications, but that she can’t compete with larger manufacturers. “Before was a bitbetter, people had more money and appreciated the traditional farming more”, she says. On one market stand, filled with seasonal vegetables, jars of pickled veggies and with garlands of peppers hanging, I met Marija. She comes from the south of Serbia, a region well-known for cayenne peppers. She told me a lot about the vegetables she’s producing. It is characterized by non-hybrid seeds, that can’t be found in a lot of places. For instance, she cultivates unique sorts of onions and garlic which haven’t been changed or modified at all. She also told me about the unique tomato sort called “volovsko srce” (literal translation – bull’s heart). This tomato is not like the ordinary tomatoes you’ll see in your local markets – it’s irregular in shape and big, not so appealing to the eye at first glance. But, at its core, this old sort saved the sweet taste of first, unmodified tomatoes. When asked about how her business is going, Marija told me that she has regular customers (whether local people or foreigners) that are always coming back for more. This allows her to maintain her method of ecological, non-hybrid farming. Because it’s an early spring, most of the market stands were filled with vegetables typical for this part of the year – kale, spinach, Brussels sprouts, celery, spring onions, cauliflower and much more. In overall, most of the vegetables are produced by small manufacturers, with little or no chemicals added in a process. Some of the farmers say that they have many problems that come with the small, organic production. The problems are poor distribution and inability to compete in terms of quantity and price. But some of them who offer unique products and who managed to get regular customers are very satisfied. 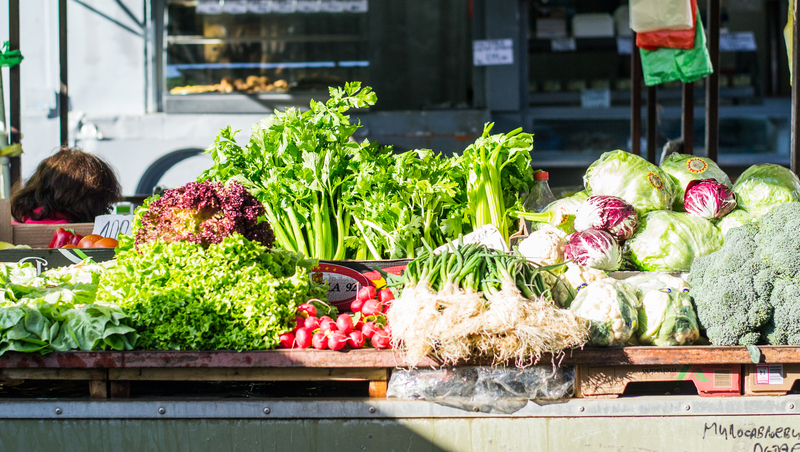 To sum it up – Bajloni market is a place to go if you want to find ecological, good-quality, organic food in Belgrade. And while you’re there, lose yourself in the streets of Dorcol, an old, historic part of town that carries a lot of told and untold stories about the Belgrade’s past. You’ll love it, I’m sure. Soceania é uma plataforma para promover iniciativas de economia social e solidária, como um diretório global de produtores e prestadores de serviços, bem como um espaço para promover valores agregados como paisagens e compartilhar experiências. Ponte em contacto para sugerir paisajes, produtos, serviços ou si quer participar na criação de Soceania.